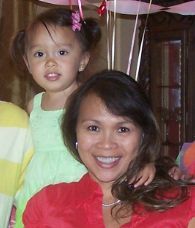 You'll discover many Easter card ideas and other homemade card ideas to choose from on this site. 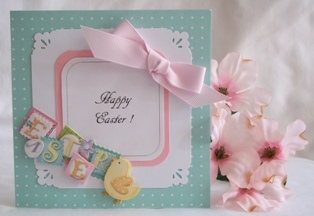 When you make an Easter card, think of pastel colors, polka dots, floral & checkered prints. Bunnies, Easter eggs and baskets are common themes also. There are lots of stamps and stickers of bunnies, eggs and chicks that can be commonly found around your local stores as it gets closer to the holiday. 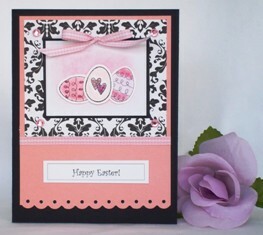 This pink and black Easter card uses gingham ribbon with a black and white print from scrapbook paper. I used an Easter stamp that featured Easter eggs. I embellished the rest of the card with brads and adhesive gems. For this handmade Easter card, I created the sentiment on my computer and added decorative elements to it so that my handmade card doesn't end up using a lot of embellishments and therefore, needing only one sticker. This Easter card would be cute for a niece, nephew or grandchild because the playful Easter egg sticker shouts Easter. You can make several handmade Easter cards with a pack of stickers. For my paper card making ideas, I try to stretch my dollar and think of how I can use only one sticker for each card. Make your own Easter cards using gingham paper. 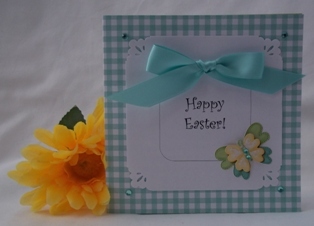 Gingham is great for using on cute cards like baby cards or Easter cards. Type your sentiment on your computer and add a border. Once the sentiment is stored in the computer, you can always retrieve it when you have to make quick handmade greeting cards. This card is really simple to make once you cut out your sentiment. Just a bow and sticker and gems. 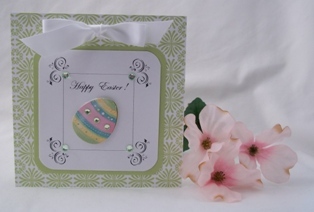 For your Easter card designs, try a decorative corner punch. For my handmade card making projects, I try to incorporate my craft punches. Click for instructions This homemade Easter card is simple to make and I used a decorative corner punch on white cardstock paper. 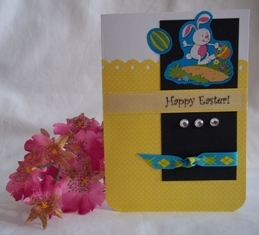 Look to your existing homemade card ideas when thinking of ideas to make Easter cards. I've used this design on birthday and thank you cards and just changed the sentiment to say "Happy Easter". Easter gift ideas for everyone. Discover easy Easter gift baskets for you to make this easter.